Since this may be the last week I get to dine out (I should be real busy once I become mummy! 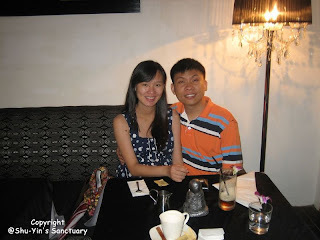 ), Peter brought me to Opera Restaurant in Upper Penang Road. I had wanted to try their set lunch there as I heard many good reviews about it. We were the first patrons there at 12 .30 noon. Soon after, a few tables arrived. At slightly after 1pm, about 12 ppl came in. The business there seems good. We went there with high expectations. With my stomach growling, I was hoping for a bigger portion. The appetizers and deserts are fixed for the day. We had choices for the main of either chicken or fish. We took one of each. And for the drinks, I chose ice lemon tea and Peter chose coffee which will be served later. Drink - Iced Lemon Tea. The iced lemon tea was very thick but refreshing. 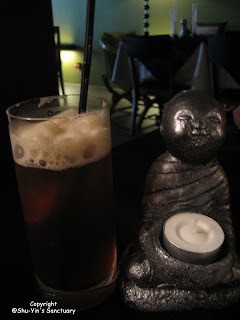 The worst iced lemon tea I had ever tasted is at Tanjung Bungah's El Mondo Pizza. 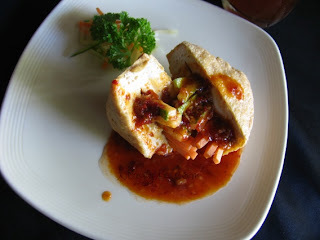 Appetizer - Stuffed Bean Curd Puff with Chef's Special Sauce. Both of us are not fans of taukua. This version of taukua sumbat however tasted very nice. We liked the sauce so much that we asked for more. 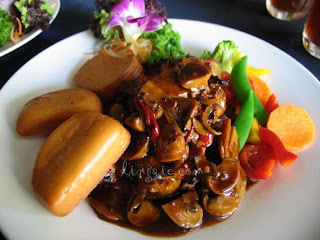 Main - Grilled Chicken with Spicy Mushroom Sauce served with Fried Mantaus and Vegetables. I find the grilled chicken goes very well with the fried mantaus. Although I hope that the mantaus are a little more soft on the inside. 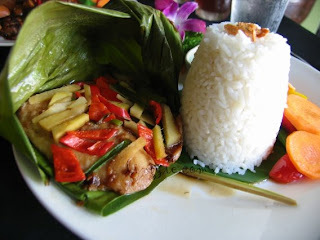 Main - Steamed Fish Fillet in Banana Packet, served with Rice and Vegetables. I like this dish although usually I am not a fan of any fish dish. But the sambal dip that goes with it makes it so nice. The rice is very fragrant too. 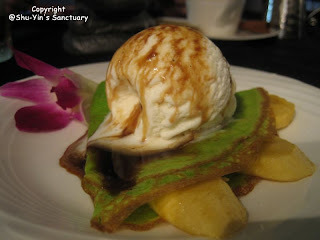 Desert - Apung-style wrapped with slices of bananas and served with Vanilla ice-cream with drizzled gula melaka sauce. I love this desert. Although both of us were so stuffed after finishing our mains, we also finished every last drop of this delicious desert. Peter's coffee cane with a cinnamon stick as the stirrer. 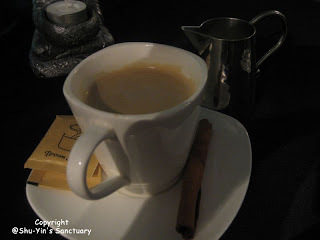 I love the aroma of the cinnamon stick! Pic of both of us at Opera Restaurant. I don't know why Peter is squinting his eyes! All in all, it was a very worth set lunch at RM18+ per set. The dishes vary from day to day. Every day of the week comes with a different set lunch style. Now that we've tried Thursday's set lunch, we are going to come another day the next time!